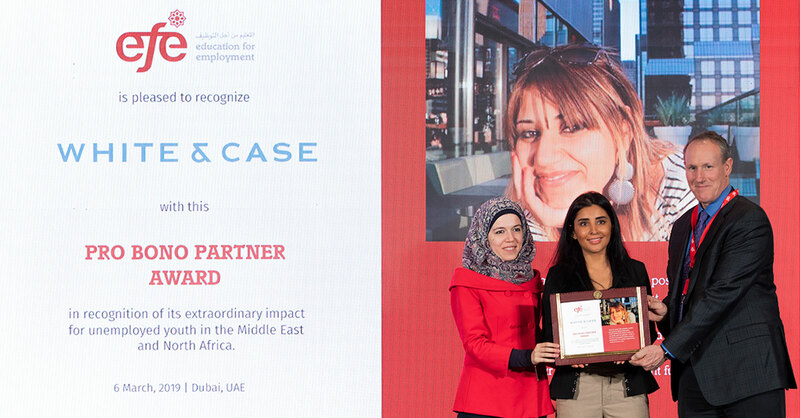 Education advocacy nonprofit Education For Employment (EFE) honored White & Case with its "Pro Bono Partner Award" at the EFE Partner Awards ceremony in Dubai on March 6. EFE conferred the award for White & Case's "generous pro bono support to EFE in the UAE," according to EFE. This is the inaugural year for the EFE Partner Awards. EFE is the leading nonprofit training youth and linking them to jobs across the Middle East and North Africa. White & Case guided EFE through the complexities of registration in Dubai and through various legal matters, enabling EFE to establish and maintain its official presence in the UAE, which has helped to generate partnerships and visibility that have catalyzed EFE's effectiveness in linking unemployed youth to the world of work across the Middle East and North Africa. White & Case lawyers performed a firm-record 120,000 hours of pro bono work worldwide in 2018, including work landing a victory for children affected by the Flint water crisis and helping to found the first law school in Bhutan. The firm's Pro Bono Practice is among the world's largest. Andrew Baird, CEO of EFE-Global, presenting the award to Nour Tarkji, paralegal in White & Case's Dubai office, and Dubai associate Sonia Abdul-Rahman.